Liquitex offers the broadest range of acrylic mediums to inspire creativity at every stage of the painting process. Varnish Mediums protect the painting surface from the environment and protect the pigments from ultraviolet light. Additionally, varnishes can be used to change or unify a painting’s surface sheen. Liquitex varnishes come in several different sheens which can all be intermixed for a customized sheen. 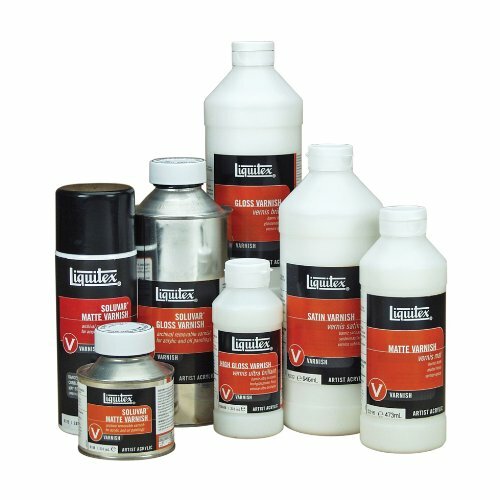 Liquitex Archival Permanent Varnish Finishing Medium is a low-odor, permanent and durable medium with water-based technology, translucent when wet, clear when dry. Resists discoloring (non-yellowing, non-fogging) due to humidity heat and ultraviolet light. Can be used with Spray Paint, Heavy Body, Soft Body. Dries to a non-tacky, hard, flexible surface that is resistant to dirt retention. Hard, archival, non-yellowing and water-resistant when dry. Protects acrylic color from harsh elements. For interior and exterior use. APPLICATION: Apply as a final varnish over dry acrylic paint. Varnish surface and environment must be clean, dry and dust free. Acrylic paintings must be completely dried and cured for 48-72 hours before varnishing. Application may be done by brush or spray. Generally a sprayed application will be thinner, smoother and more even. Rolling or sponging application is not recommended. Caution: Acrylic paints and mediums become increasingly brittle in cold weather. Do not apply below 60 degrees Fahrenheit. Visit our Liquitex Amazon Storefront for full product assortment. Copyright © 2019 Stencil Designing.